The first school teacher was Miss Julina Temby, a daughter of Mr W. Temby, the first storekeeper. She used a room of the verandah at the store as a school room. When the church was built and officially opened in December 1873, the school moved to the church and remained there until the public school was built. It opened in 1878 with eight pupils and Mrs Ambrose was the first teacher. She was followed by Miss Jenkin then Mr Ryder. In 1882 Miss Alice B. Hinde was appointed. The enrolments in the first four years ranged from 8 pupils in 1878 to 5,4,8 and reached 15 pupils by 1882. There was a record high of 49 enrolments in 1885 and again in 1895. After 1912 the enrolments fluctuated between about twenty-five children to thirty-five children, with some low years post World War Two. During the final three years of operating, the enrolments at Windsor School were once again down to 15 pupils. 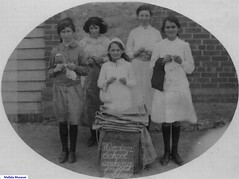 The school had an active Welfare Club. 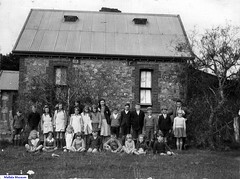 Following the closure of the Windsor School, the majority of the children were transported 19 km. by school bus to the Mallala School. The photograph of the sundial is included in the article because it recognises the closure of the Windsor School. 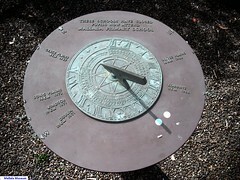 The sundial is installed at the Mallala School with engravings to show the distance,the date of closure and the direction that the Windsor school was in relation to Mallala. I attended Windsor Primary School from 1952 until 1957. The teacher was Mr Jack Atkin. There were about twenty pupils and I was the only one in my class every year. Do you remember Windsor School ? Then Join up and add your memory here.